For the first time EVER, all four of my Cymbidium orchids are blooming! 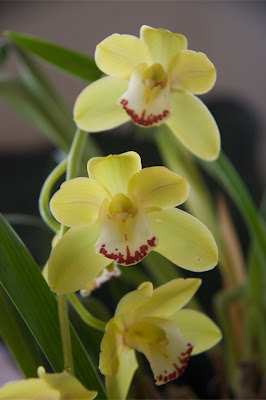 Back when I wrote my first orchid book (2002) I warned readers that Cymbidium could be tricky to bloom indoors because of the temperature drop required to set bud. You know how I like a challenge. I've never actually bought a Cymbidium for myself, but when they finish blooming for clients, I bring them home and experiment. I think I've got it down. The Cymbidium go outside in May and spend 4-5 months in the shade of a blue spruce. They're the last house plants to come indoors in October, staying out till nighttime temps get into the upper forties. I move them to a north facing window in the guestroom, and set the thermostat to fifty. I usually see several bloom spikes start in February; last year I spoke harshly to one recalcitrant orchid, explaining that non-productive plants might find themselves on the compost pile. Would I really have done it? We may never know. Thanks Mother Nature, I'd say we're even. P.S. Clivia says hello, too. She sits on the cold windowsill, next to the Cymbidium Sisters. Years ago I sang that line as Trina in Falsettos. It's a good question. After 3 weeks away from home I needed some normalizing, normalization, normalness. Only one place to find that: in the kitchen. 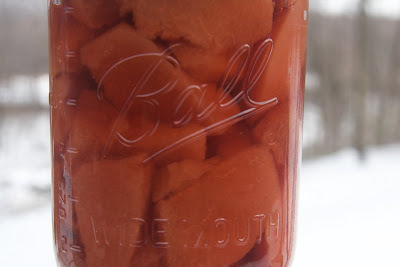 Since our freezer door barely closes, I started there, and pulled out the vodka soaked fruit that I'd used to make fruit infused vodka. Nothing shall go to waste! The vaguely alcoholic gooseberries, currents, green grapes, and sumac berries are now a fantastic, not-usually-found-in-nature vermillion jelly. Don't let the photo fool you; I've got at least 10 half pint jars. Always more than I expect. Next stop: refrigerator. Six giant quinces have filled the fruit drawer since Christmas and their pervasive perfume reminded me that I'd better do something with them asap. I've been missing fresh fruit lately (big surprise) and while quinces are WAY too hard to eat out of hand, they're delicious poached. 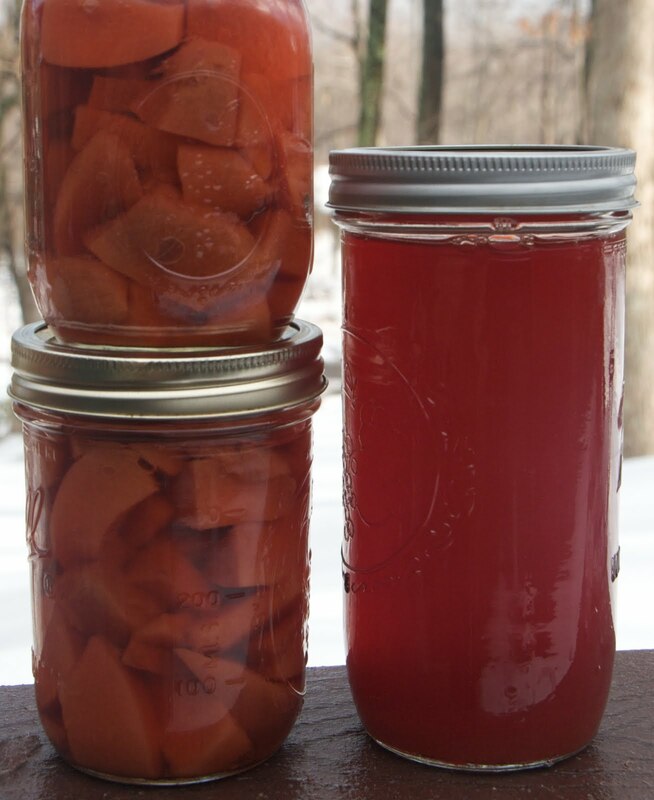 What could be easier than a vanilla bean, a few star anise, very light simple syrup, and peeled, cored, sliced quinces, in the slow cooker for 8 hours? 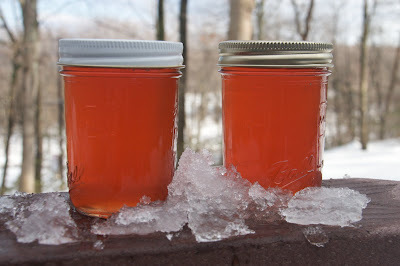 Bonus: I now have 2+ pints of brilliant red, quince poaching liquid. Far too beautiful and tasty to throw away. I've canned it for now, but I'm pondering what wonderful thing(s) I can make with it. 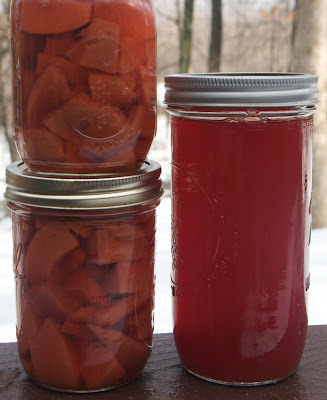 Reduce it to a syrup and pour over the quinces with yogurt? Freeze into a sorbet? I'd appreciate suggestions.